And still, when in doubt, observe. When you don’t know the what or why or how, focus on what you can see, hear, smell, touch, feel, taste, focus on observing. I know one name of this peppersoup spice, from the market – it is umilo/ emilo/ omilo/ amilo in Itsekiri. Google searches have not drawn up much. Where I thought there was gold, one but found nought. 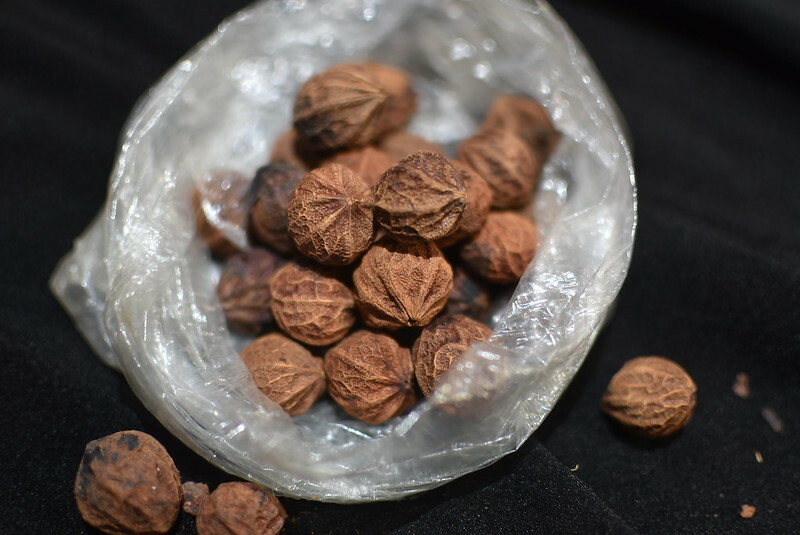 Two papers ‘misname?’ it – in one it is referred to as Parinari Excelsa which we know to be gbafilo, a seed within an eggshaped nut; another calls it coriandrum sativum, coriander seed – the magnitude of size difference is way off the mark. Coriander seeds are on the millimetric scale and these ones on the centimetric. There’s a story here about the year I lost my voice. What I lost in vocal stretch I gained in better hearing and observing. There’s also the 1999 memory of not knowing what the outcome of my six-week final year field work project to Glenties, Ireland would be. Again, when in doubt, observe. When you notice the details, you can investigate their meaning at a later time, place, in conversation. And that brings me here – to you. Here’s me hoping that you might know the name of this spice, based on my observations. That if I detail shapes and sizes, flavours and aromas, you might decipher the botanical name. 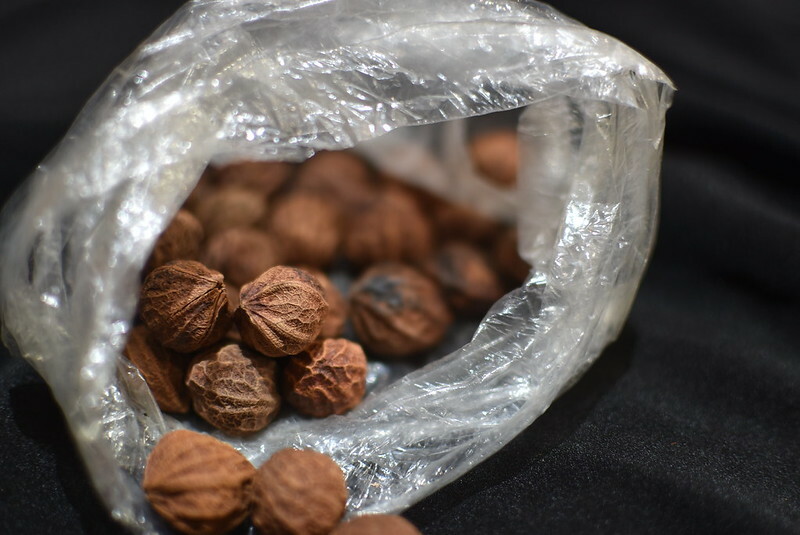 I think that may be key to unlocking the potential of this nut, spice, often used in pepper soup. 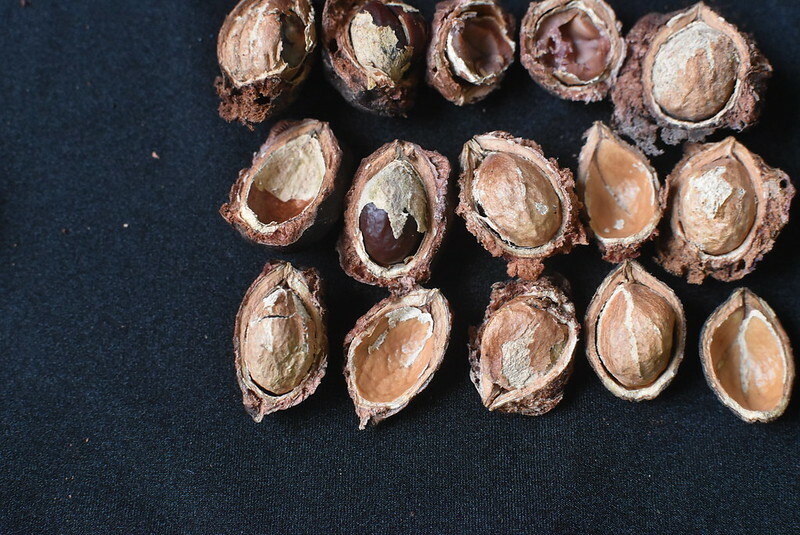 The skin around the roughly 2cm long nut is leathery and in many cases appears sliced off prior to drying. The colour ranges from dark/ black to tan brown. Inference: The skin/ flesh is left on during the drying process. Perhaps it protects the nut from going bad. The shell is a mid-brown, honeycombed in pattern with vertical striations from a pointed tip to a round base. Striations vary with most nuts having 6 – 8 ridges with intervening honeycomb, dendritic, vein-like networks. 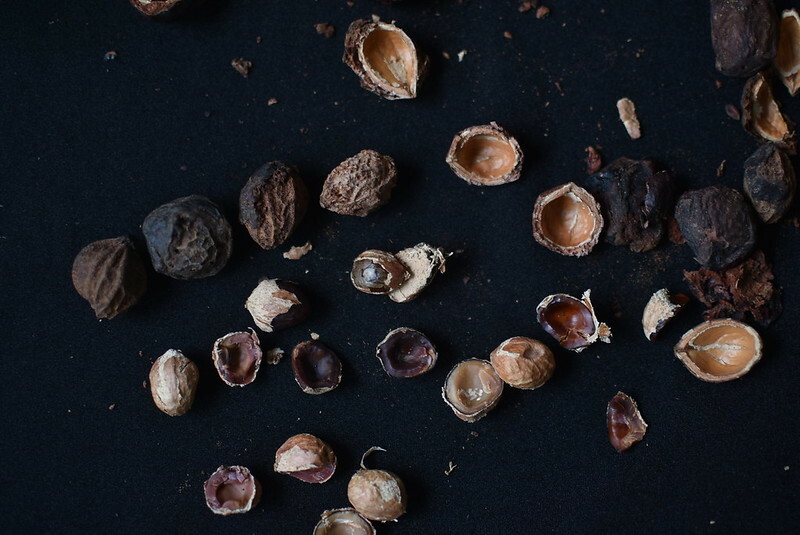 The nut sports a tree-veined papery skin and is aromatic, in a tonka bean, complex way. 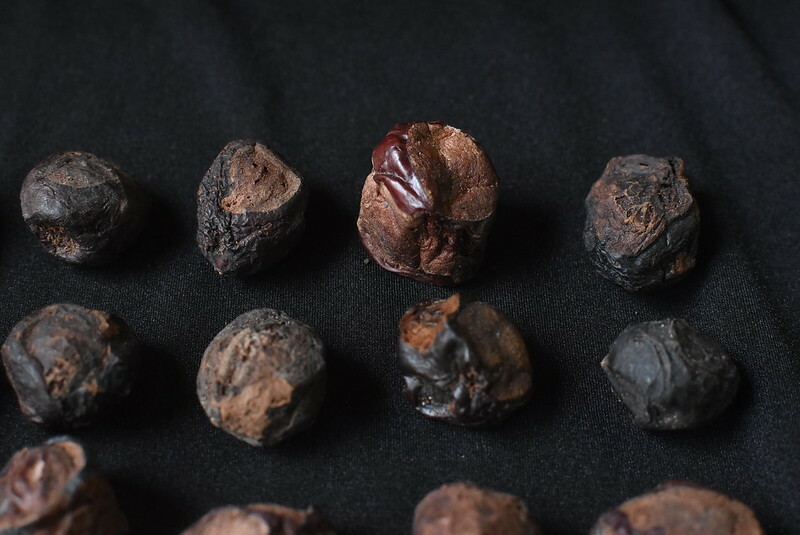 The nut itself has a sheen and colours vary from light to dark, with purplish tints sometimes. Nut is crunchy, reminiscent of walnuts, nutmeg. Mouthfeel – starts of bitter, ends up dry and aromatic. Other flavours – almond, chestnut, who knows what else? Inference: Look and taste of some nuts suggest it is high fat – sheen and rancid. 1. 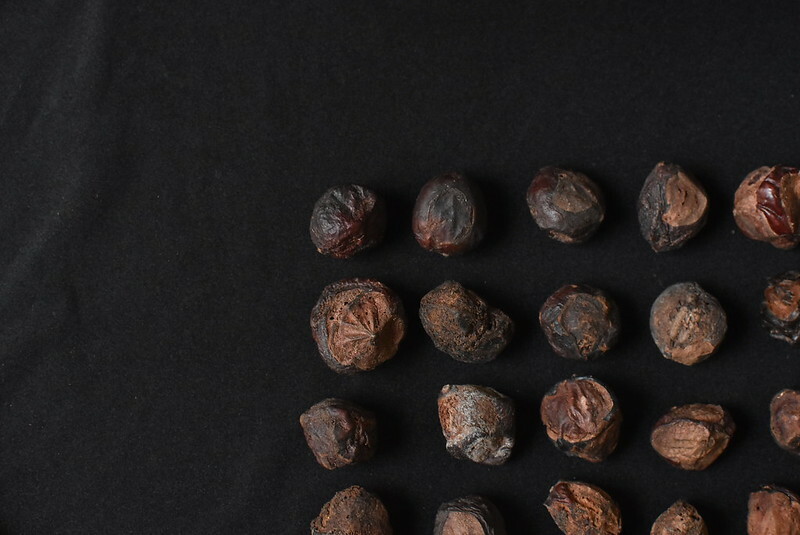 Related to the walnut family, based on tastings with friends – about walnut/ purpulish tint. This led to a paper where they described a variation in walnut kernel colours which I observed here so perhaps, there is a relationship? 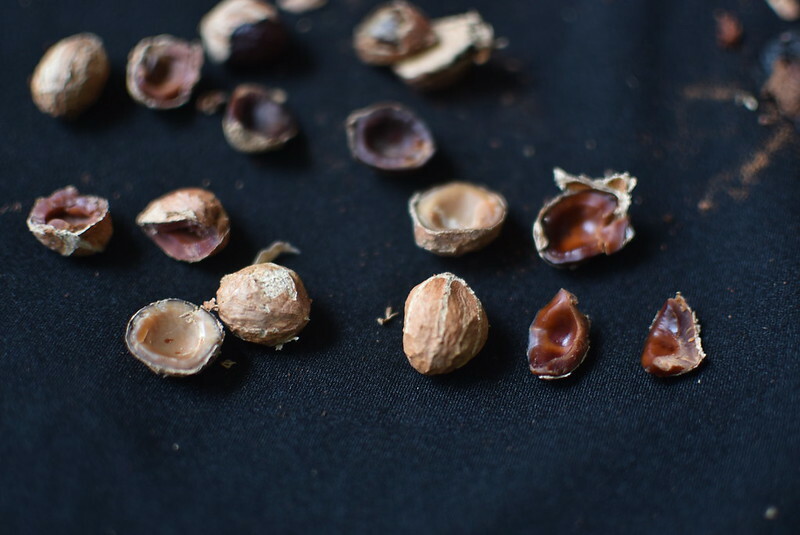 In addition to shell thickness, kernel size, kernel percent, tendency to yield large pieces of kernels when cracked, and flavor, kernel color is a component of black walnut fruit quality (Funk, 1979). 2. 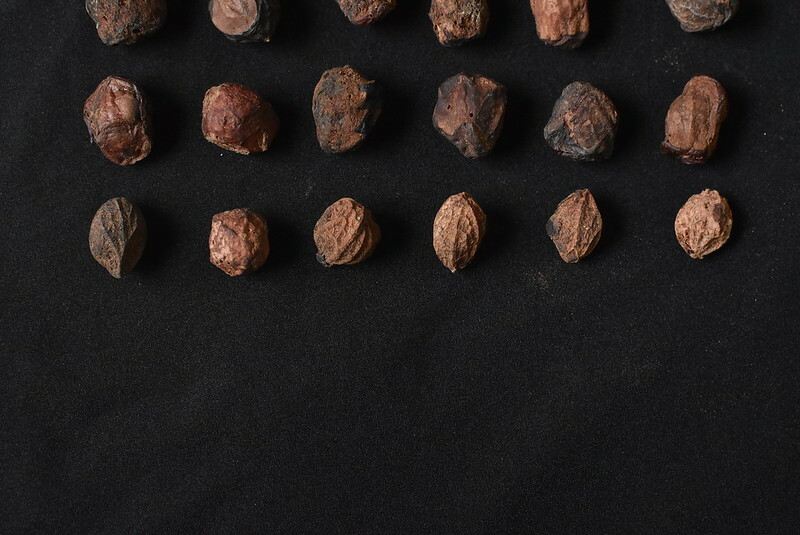 Based on the discussions about it being in the walnut family, I search for images of walnuts and discovered that the shells looked similar, particular to the butternut. Do you see the resemblance in the shell patterns? In the end though, I haven’t been able to find out more because researching the butternut brings up a different internal shape/ configuration. Here’s where I need your help. Do you know the name in ANY language? Or uses? Or any other detail which might help me unravel the mystery of what this is called? Please ask your grandma, your mum, dad, auntie, uncle. Let’s solve this mystery. Till then, more on Nigerian spices coming your way.